Bring vibrant colour to your patio pots, beds and borders each spring! Excellent for cutting for stunning indoor displays! Flowers from March to May. Displays get bigger and better each year. Will grow to about 30cm (12 inches) tall. A mix of wonderful shades and colours to brighten up any garden. Tulips are one of the most popular bulbs as they are perfect when planted with a mix of different colour variations to give vibrant spring colour to your garden, patio or decking. Their compact nature keeps them in neat form and means they won't topple over or takeover beds and borders. It also means they are fantastic for filling up pots and containers on the patio. This mix is the perfect all-in-one solution to adding a rainbow of colour to your garden ready to burst to life next spring. 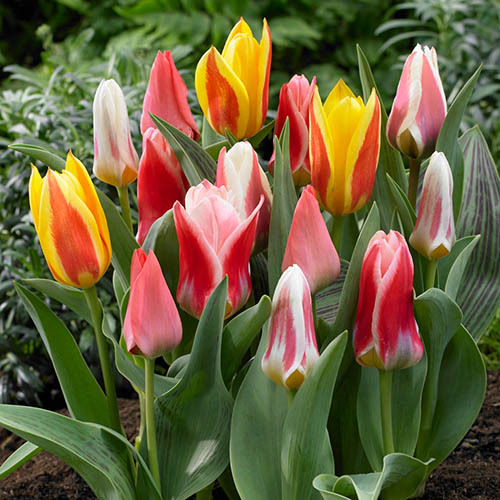 Tulips are easy to plant, grow and care for - maximum impact with minimum effort! Don't forget - they also make stunning cut flowers to brighten up the indoors as well as outdoors! Plant in the autumn for stunning spring displays. Supplied as a pack of 50 bulbs, ready for planting. Size: 9/11.